We provide solutions to meet the technology, information and brokerage needs of brokerage firms and banks worldwide. 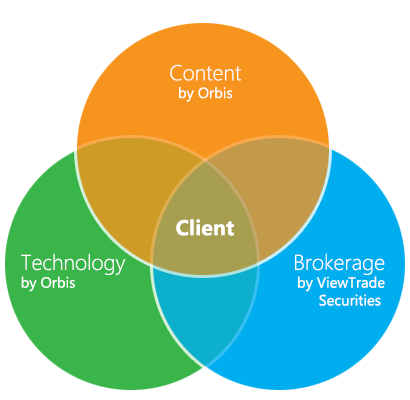 ViewTrade for Business brings together the capabilities of ViewTrade Securities and Orbis Systems to provide solutions to meet the technology, information and brokerage needs of brokerage firms and banks worldwide. We specialize in Agency Brokerage for the Wealth Management, Private Client and Retail Brokerage Divisions of regulated Brokers and Banks in AML compliant countries. We understand customer service and provide functionality that increases your customer service team’s efficiency while increasing both theirs and your customer’s satisfaction. The Watchmen Engine provides the transparency and rules-based controls that protect your business and ours, as well as the custodian's, providing your business with the stability it needs to grow. Orders are typically one directional: either a buy or a sell order in a given security. DVP settlement to a bank custody account works well in this unidirectional order flow. The custody account will experience multi-directional orders in the same security. DVP settlement is very inefficient. The buy and the sell in the same security must both be settled separately, and any break in position or money can cause the entire settlement to fail. A brokerage custody account makes this simpler provided that your firm can comply with U.S. rules and regulations. We make this easier via our Watchmen Engine and knowledge in all aspects of U.S. brokerage. The Watchmen Engine provides automated Rule 15c3-5 and AML compliance, pre-trade, post-trade and real-time. For example, it checks orders against buying power, position, and client trading restrictions before the order is delivered to the market. In addition, multi-directional order flow requires pre and post-trade monitoring for spoofing and layering, wash trades and other forms of market manipulation via the Watchmen Engine. Owners of brokerage accounts that are opened through ViewTrade Securities and all persons that have authority over the accounts are screened by ViewTrade Securities using such systems as LexisNexis WorldCompliance, McDonald Information Services, Dow Jones Risk and Compliance/Factiva and Internet search. ViewTrade Securities' documentation and Customer Identification Program requirements must be met before the account is accepted on Watchmen and opened as an introduced account. Your firm's AML procedures must ensure that your firm is not providing U.S. brokerage services to anyone who cannot under U.S. law open an account directly with a U.S. Broker/Dealer. We can assist you and your AML advisor in understanding these requirements. Your firm's business model cannot include acceptance of physical certificates or trading in certain low-priced securities. The Watchmen Engine has restrictions built in to block such activity pre-trade and ViewTrade Securities does not accept physical certificates into your custody account. Compliance with IRS Chapter 3 (Withholding of Tax on Nonresident Aliens and Foreign Corporations) and 4 (Foreign Account Tax Compliance Act) regulations does entail disclosure of beneficial owners holding assets in your firm's custody account to the IRS. We can assist you and your tax advisor in understanding these requirements. Services in setting up your U.S. brokerage offering locally and in complying with U.S. rules and regulations, including IRS, FINRA and SEC. Turnkey technology and bespoke technology development services. Turnkey content and content integration, including customized financial information portal , with original content in your local language. Execution and Net Settlement of all trades on your behalf handled by ViewTrade Securities, which simplifies funding and maintenance of the account. Your traders and staff are freed up from having to reconcile with multiple execution venues. ViewTrade Securities handles order routing and provides a full report of the execution by the venue to you in real-time. Clients receive a single and complete transaction file, regardless of the number of venues involved in the execution of an order. Improve Risk Management by having order-level edit checks, such as position limits, cash, easy-to-borrow stock list, broker restrictions, and buying power. Assistance with IRS compliance – Forms 1042, 1042-S, filing extensions, referrals to third-party IRS compliance software, application for QI status, QI Withholding Statement compliance, and more. FINRA BrokerCheck reports for ViewTrade Securities, Inc. Brokerage services are offered by ViewTrade Securities, Inc. Member FINRA, SIPC, NYSE Arca, NASDAQ, CBOE Edge, CBOE BATS. Technology services are provided by Orbis Systems, Inc.
© 2019 ViewTrade Holding Corp., Inc. All rights reserved.